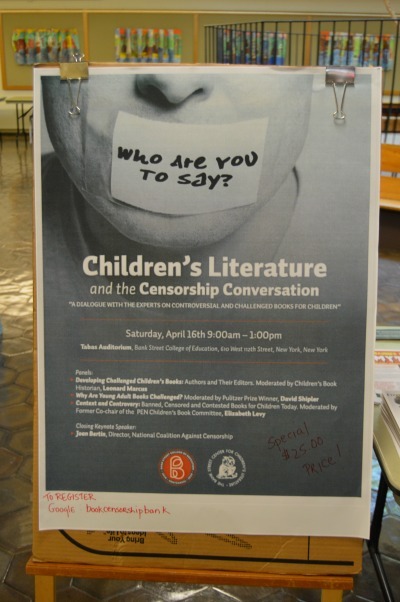 At “Who Are You To Say?”, an event held in New York City on April 16, authors and kid lit experts weighed in on where to draw the line between being aware and censoring. What this article didn't touch on is the graphic sexuality, instructional drug use, and excessive foul language that many YA authors appear to think is the norm. When does sensitivity to maturation come into play? As we have kids as young as 10 reading from our YA section, our staff needs to be knowledgeable as to what is just plain indecency. We don't hide the books or censor them, but I definitely will tell kids that they should probably wait to read a book due to its graphic content. I find it interesting that people are up in arms about a picture of a happy slave (definitely misleading, but they'll have their misconceptions corrected in the next history class) but not about inaccurate depictions of teenage drug use and sexuality (directly harmful, and rarely addressed in realistic terms by authoritative adults). I don't believe that books should be banned or removed from library shelves, but I really wish they had similar ratings to TV shows.